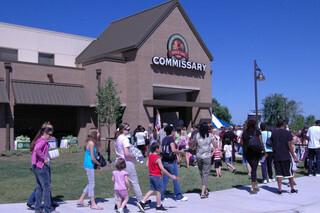 For the authorized commissary shopper, there’s no better resource for saving money than MyMilitarySavings.com. We are an online community of over 70,000 members who understand the challenges faced by today’s modern military families, and we offer an easy way to find coupons and other discounts that can help make the most of your budget. In fact, we’re the first social and mobile media network designed exclusively for military families to help them save money with up-to-the minute savings, special promotions, Defense Commissary Agency (DeCA) coupons, and other exciting offers. We provide you with quick access to Commissary Rewards through the Commissary Rewards Card link on our Coupons page, which will take you to the DeCA coupons site where you can download hundreds of coupons onto your Rewards Card and redeem them when you shop. Also on our Coupons page, we feature money savings coupons that you can print out and redeem. You won’t have to wait until you go to the commissary to get a copy of the Coupon Connexion for the latest deals; you can download a copy of the flyer so you can see featured items and plan your shopping list accordingly. And speaking of shopping lists, click on our proprietary “My Shopping List” tab for a desktop and mobile app where you can create, access, and even print your shopping list. Every commissary shopper should use this! Additionally, helping you become a savvy shopper at the commissary is just the beginning of the many features you’ll find at MyMilitarySavings.com. We offer discounts from select retailers aimed at the military community, as well as travel deals from well-known airlines, cruise lines, and resorts. For more information about how every commissary shopper can serve, save, and enjoy, join MyMilitarySavings.com for free today on our sign-up page.